Metal thieves shattered Thursday the base of Alexander Zaid's monument at the Beit She'arim National Park near Kiryat Tivon and pulled the statue itself out of its base. Zaid's grandson, who lives in a nearby kibbutz discovered that the monument was vandalized and called the police. Zevulon Police chief commander Jamal Khakrush estimated that perpetrators attempted to steal the bronze statue in order to sell the metal. "The signs indicate that the thieves tied a rope to the monument's base, which is made of stone, and pulled it using a vehicle, causing the statue itself to fall on the ground," commander Khakrush explained. "However, the thieves did not take the statue with them. We still don’t know whether they were interrupted in the process, or whether they planned to return later and collect the statue," he added. Zaid was born in 1886 and immigrated to Israel at the age of 18. In 1907 he founded, along with six of his friends, the secret defense organization Bar Giora, which later became Hashomer. In July 1938 Zaid was shot to death by a Bedouin assassin who was waiting for him near his home in Sheik Avrech. Zaid's monument was designed and built by sculptor David Polus, who was considered one of the most prominent artists during the Zionist aliyahs period. The statue was originally made of stone, but was later cast in bronze. 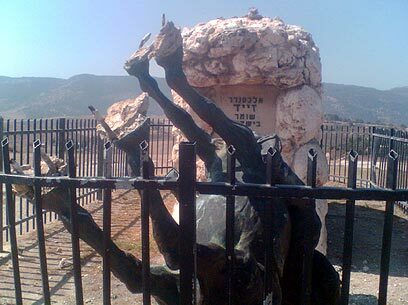 The monument depicts Zaid sitting on a horse and overlooking the Jezre'el Valley fields. See all talkbacks "Metal thieves vandalize Alexander Zaid's monument "